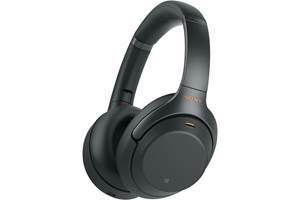 A common radio frequency range on which wireless devices operate, including Bluetooth® devices like wireless headphones. This is also the frequency range of many household devices, such as microwaves, cordless phones, and Wi-Fi® networks, which can potentially lead to interference and signal degradation. An adapter that connects the mini plug or full-sized jack of most headphones to the two 1/8" mini plugs that most airplanes use for audio. A type of headphone driver, armatures consist of a moving magnet connected to a diaphragm that creates sound when an electrical current is applied. Armatures are mostly used for in-the-ear earbuds and hearing aids because of their small size and low impedance. 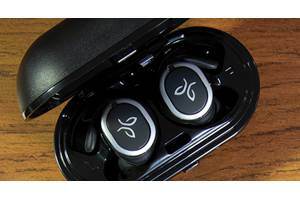 However, they're generally limited when it comes to reproducing frequencies lower than 20 Hz and higher than 16,000 Hz, and require a good seal in your ear to deliver their full audio range. Around-the-ear headphones have an extra roll of padding that surrounds the ear to block out external noise. This kind of earcup is large and fits over the ear, usually surrounding it with an extra roll of material. Also known as a sealed design, it helps keep outside noise from penetrating the ear. It also prevents the audio being played through the headphones from disturbing others. However, since sound has a tendency to reverberate in enclosed spaces, this type of design may cause some minor unwanted resonance. Extends from both earcups, with one cable longer than the other. Both cords come together off center, to the side of the neck, or close to one ear. This design keeps the cord to the side and out of the way. A design in which the headband rests against or hovers slightly above the back of the neck. Behind-the-neck headphones are popular with people who don't wish to mess up their hair, or for active users who like to wear hats or sweat bands. A short-range wireless technology that allows devices to connect to one another and transfer information. Up to eight devices can connect to the same network (or "piconet") with a range of about 30 feet. Current Bluetooth-enabled devices operate in the 2.4 GHz radio frequency range, but future versions will operate in the 6-9 GHz range to avoid interference from other wireless devices. Some wireless portable headphones use Bluetooth to connect to compatible devices, such as cell phones and MP3 players. A way of recording audio that produces a 360-degree listening experience when heard through headphones. Any pair of headphones with good right and left channel isolation can sufficiently reproduce this effect, although higher-quality headphones will do a better job. The standard unit of measure for expressing relative power or amplitude differences. With audio, it represents loudness. One dB is the smallest change in loudness most people can detect. A 1 dB difference is barely noticeable, but a 10 dB difference will sound roughly twice as loud. A normal conversation usually takes place at 60 dB. An iPod at peak volumes produces about 115 dB of noise. A gunshot or fireworks can reach 140 dB. Government research suggests that people should not listen to volumes higher than 85 dB for more than eight hours a day. Any one of the parts in a speaker that compresses and refines air to create sound waves. 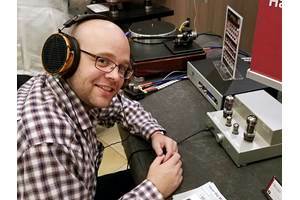 Most headphones use "dynamic" drivers, which consist of a permanent magnet (typically ferrite or neodymium), a voice coil, and a conical diaphragm, much like any home theater speaker. You can count on them to deliver a full range of sound with plenty of detail and clarity. "Static" drivers, on the other hand, consist of a thin membrane (typically PET) stretched between two electrodes. The entire diaphragm is driven in static drivers, whereas only the voice coil really moves in dynamic drivers. Static drivers are thus more sensitive and can handle a wider frequency range with hardly any distortion. They require much higher voltages to power them, and so you're more likely to find them in higher-end headphones that require a separate headphone amp. 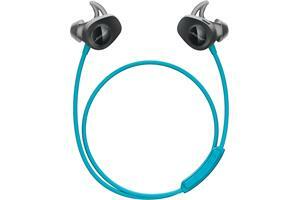 Earbuds like this one fit just outside the ear canal, and block out some external noise. A tiny earphone that inserts into the ear. Some earbuds rest in the outer part of the ear canal, like Apple's iPod® earbuds, while others actually insert inside the ear canal for a more secure fit that also passively blocks out external noise. Some earbuds use behind-the-neck headbands, ear clips, ear hangers, or ear loops to keep them secure inside the ear, although many rely on the naturally snug fit within the ear canal to keep them in place. Often made of wire or plastic, ear clips fit around the back of the ear and hold the earbuds in place. Some ear clips are flexible, so that they can be manually formed to the ear for a more secure fit. Also known as earbud "sleeves." The rubber, foam, or silicone material on the end of most earbuds that fits into the ear canal. Many earbuds come with a variety of gel sizes to fit the unique size and shape of an individual's ear canal. It's important to use gels that fit properly. Gels too small may not create a tight enough fit with the ear canal, allowing the earbuds to fall out. Gels that are too large may cause pressure on the ear canal that can be uncomfortable and often painful over time. The general term for the enclosure that rests against the ear and contains the drivers that reproduce sound. Earcups are traditionally connected by a headband that rests on top of the head. Earcups can either be sealed or open. A sealed design (also known as a closed design) completely covers and sits around the ears with extra padding to help block out external noise. Open earcups rest on top of the ear and allow some external noise to reach the ear. Earcups can be made out of various materials, including rubber, foam, and synthetic fabrics. 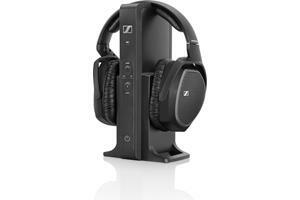 Generally the more padding, the better the earcup's ability to block out noise and the heavier it tends to be. Earpads also have a tendency to wear over time, so it's also a good idea to look for 'phones that offer replaceable earpads. Ear hangers make a full loop around the ear to secure the earbuds. Like ear clips, ear hangers are usually full, open loops that rest or hang around the ear to hold the earbuds in place. Sometimes also called "ear loops." The range of sound an audio component can reproduce, measured in Hertz (Hz). The wider the range the better — the bass will be lower and the treble will be higher, giving you a more realistic sonic impression. Humans can perceive sounds from 20 to 20,000 Hz. The lowest note on a bass guitar is about 41 Hz. Most male vocalists have a range between 100 and 500 Hz. Cymbals hit at about 15,000 Hz. Most headphones cover the 20 to 20,000 Hz range. Higher-quality headphones may even cover greater ranges, such as 16 to 25,000 Hz, although headphones traditionally have difficulties reproducing ranges lower than 20 Hz due to their small enclosures. Many portable headphones use a headband that folds in on itself so that it can be easily stored for transport. This plug is an older standard still used for high-quality audiophile headphones. 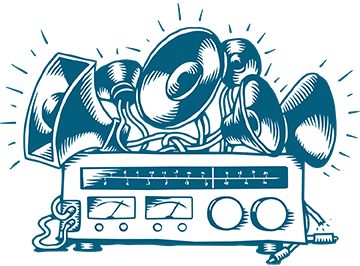 Most full-sized jacks accept stereo signals — this capability is indicated by two rings around the plug, rather than the older one-ring mono sound plugs. Adapters are available that convert full-sized jacks to smaller mini plugs, and vice versa. Impedance is a measure, in ohms, of the resistance of a speaker's voice coil to the current supplied by the amplifier. Generally, the higher the impedance, the more electrical energy is required to drive the headphones' tiny speakers. Because of the limited power available from a portable player, headphones for portable use should have a maximum impedance of 64 ohms. The lower the impedance, the more efficient the headphones. You'll get more volume out of your 'phones, and your MP3 player's battery will last longer. In-the-ear refers to earbuds that rest inside the ear canal. They typically have the added benefit of passive sound isolation, and usually are not connected by a headband, although they may use ear clips, ear hangers, or ear loops for a more secure fit. In-the-ear earbuds are the most common design for portable headphones since they're lightweight and less bulky than traditional headphones. Wireless headphones that use infrared transmission come with a transmitter that connects to an audio source's headphone jack, stereo RCA output, or optical digital output. IR transmission works by sending out signals of infrared light from the transmitter to the headphones. The headphones must be within line of site of the transmitter, since the signal can't pass through walls, furniture, and other obstacles. That's part of why IR transmission usually has a shorter range than RF transmission. A smaller and more common version of the full-sized jack. The 3.5mm (1/8") mini plug was introduced by Sony in 1979 for its portable Walkman®. It's widely used today for portable media players, although adapters are available for converting mini plugs to full-sized jacks and vice versa. Neodymium is one of several rare earth metals used in creating the small, high-strength magnets commonly used in headphone drivers. Noise attenuation describes any reduction of unwanted sound. Noise-canceling headphones achieve this by using a microphone to pick up outside noise and then actively reduce the noise by creating an out-of-phase signal. Noise-isolating headphones reduce noise passively by using extra layers of padding around the earcup or an in-the-ear design. Noise-canceling headphones use tiny microphones built into the earcups to pick up the noises around you. 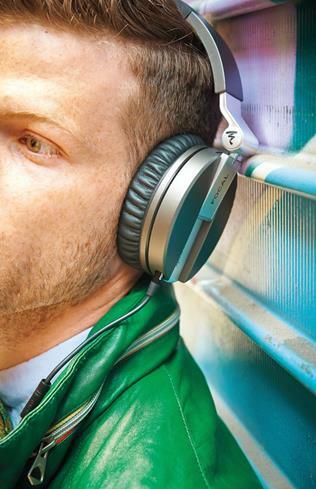 The headphones then play an out-of-phase signal, which helps to cancel and quiet the noise. These types of headphones use batteries to power their noise-canceling circuits, and generally cost more than most other types of headphones. 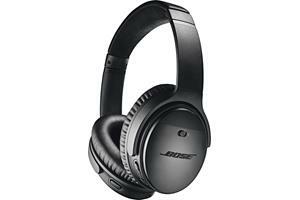 Noise-isolating headphones use dense materials around the ear or in the ear to passively block out noise. Technically, all headphones offer some form of passive noise isolation, but headphones labeled as such are specifically designed for the job. They usually promote safer listening habits, since users often don't have to turn the volume up as much to drown out external noise. The unit of measurement for impedance. On-the-ear headphones are generally smaller than around-the-ear headphones, since the padding is designed to rest on top of the ear. They have an open design that allows external sound in, so listeners may tend to turn up the volume to compete with outside noise. Because they allow sound to escape, they're less likely than around-the-ear 'phones to produce unwanted resonance. 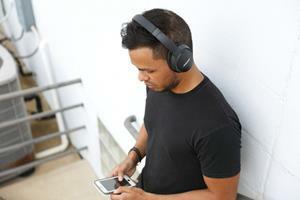 Portable headphones are generally small and lightweight for easy mobility. Some models are geared for certain activities, like exercising or wirelessly listening to music and answering calls from a Bluetooth-enabled cell phone. Most wireless headphones use radio frequency transmission to send audio information from the transmitter to the headphones. RF transmission gives headphones a greater range than IR transmission. Other devices, such as cordless phones and wireless routers, may operate in the same radio frequency, and can cause some possible interference. Single-sided cords extend from one earcup in a single cord, keeping it to the side and out of the way. Some headphones come with detachable single-sided cords that allow you to easily store your headphones, switch out the cord with different lengths, or replace damaged cords. A device that converts an electrical current into sound. Speakers usually consist of a number of drivers, such as woofers and tweeters, for reproducing a specific range of frequencies. Most headphones use tiny, scaled-down versions of big speakers to create sound. 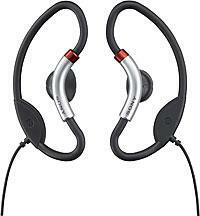 Sport-style headphones are specially designed for active use. Most feature earbuds with ear clips, ear loops, or ear hangers for a secure fit, or a behind-the-neck band for an out-of-the-way design. Many also come in bright colors and have a waterproof or sweatproof coating that allows them to be washed by hand. Swivel earcups provide a comfortable fit that better conforms to the shape of an individual's head. Vocalists and musicians also frequently use swivel earcups for single-ear monitoring so that they can listen through one side of the headphones while simultaneously hearing the external environment. Commonly found on noise-canceling headphones, this button turns off the noise-canceling mechanism to let you hear outside noise without removing the headphones. It can be handy when you need to briefly listen to something, such as when the captain makes an announcement on an airplane or when a coworker wants to talk to you. Headphones with this feature use sophisticated processing to fool your ears into thinking that sound is coming from multiple locations around you, instead of just two. Virtual surround sound headphones come in handy when you want a more private home theater experience, or when you don't want your movie or music to disturb others. Some newer headphones have virtual surround sound built in, while others require an adapter to add this functionality. 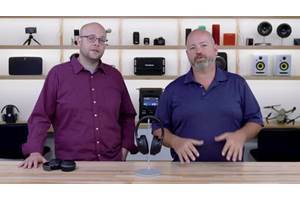 Most new receivers also offer this capability built into their headphone jack, like Silent Cinema on Yamaha receivers and Dolby's Dolby® Headphone.